This is the starting place if you are looking for a book about Quentin Tarantino. Down and Dirty Pictures: Miramax, Sundance, and the Rise of Independent Film Biskind, Peter 2004 Simon and Schuster about the rise and falls of the independent film industry around Miramax. Kill Bill: An Unofficial Casebook Holm, D.K. 2005 Glitter Books a minute-by-minute companion to Kill Bill serving as an ideal companion to the DVD releases of the films. Quintessential Tarantino Page, Edwin 2005 Marion Boyars easy-to-read analysis of the films in a literary studies approach. Quentin Tarantino: The Film Geek Files Woods, Paul 2000 Plexus Books (Revised Edition) includes five new articles on Kill Bill. Raised by Wolves: The Turbulent Art and Times of Quentin Tarantino Charyn, Jerome 2006 Thunder's Mouth Press a bio in the form of a long, book length essay. Quentin Tarantino Gallafent, Edward 2006 Pearson Longman part of the "On Directors" series. arguably the best critical study of Tarantino so far, arranged thematically. King Pulp: The Wild World of Quentin Tarantino Woods, Paul A. 1998 Plexus ..
Quentin Tarantino: Interviews Peary, Gerald 1998 U of Mississippi P collection of great interviews with Tarantino. 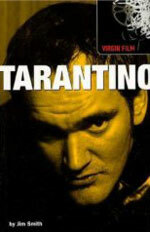 Tarantino: A to Zed Barnes, Alan & Marcus Hearn 1996 ? ? Quentin Tarantino: Shooting From the Hip Clarkson, Wensley 1995 Piatkus Books ?? Quentin Tarantino: The Man and His Movies Bernard, Jami 1995 HarperPerennial the best biography to date. Pulp Fiction (York Film Notes) Langley, Neville 2000 ? ? Tarantino: A Retrospective Tom Shone 2017 Insight In-depth look into his movies. Quentin Tarantino Yannick Surcouf 1998 Mereal Based on the same concept as the book by Alan Barnes & Marcus Hearn, Tarantino A to Zed. Quentin Tarantino Jean-Pierre Deloux 1998 Fleuve Noir A very good biography and analysis of his influences. Critiquer Quentin Tarantino est-il raisonnable? Célia Sauvage 2013 Vrin Written by a Tarantino Archives member. This page was last edited on 3 October 2017, at 14:39.